The railroad ran from Philadelphia to Bethlehem, almost parallel to Bethlehem Pike, and was eventually absorbed by the then behemoth Reading Railroad for its Bethlehem Branch. This was a lucrative rail line that not only took passengers, but also carried products to and from Bethlehem Steel, including structural steel that was sent south to build the skyline in Philadelphia, and coal to industries south. 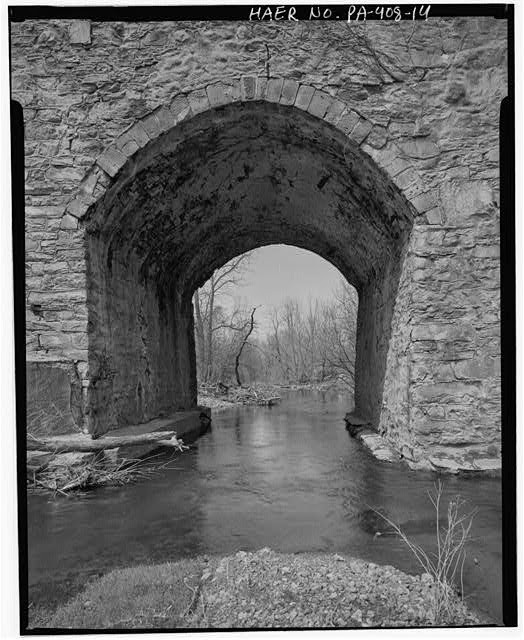 Center Valley was a haven away from the gritty industrial areas to the north of it. At one point this village was even called "Milk Town" thanks to the amount of milk that was shipped out of it. 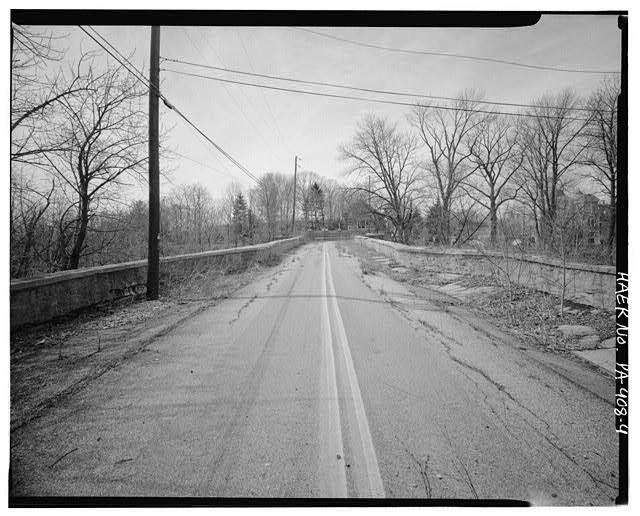 Eventually the railroad was turned over the SEPTA and commuter service was terminated in 1981. 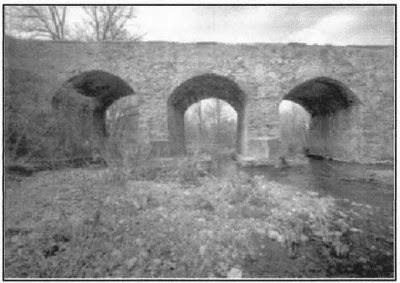 The old bridge did not end up collapsing while in abandonment, and the speculated plans for a new bridge that were mentioned in the article did not end up coming to fruition. 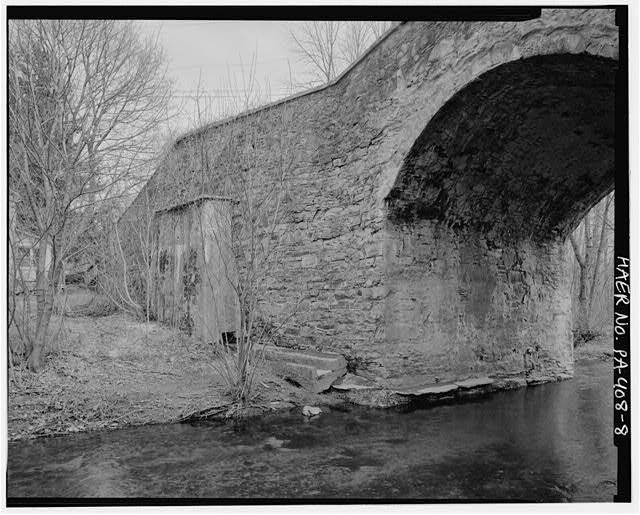 Prior to closure in 1988, it was listed on the National Register of Historic Places thanks to it being a great example of a wagon bridge. 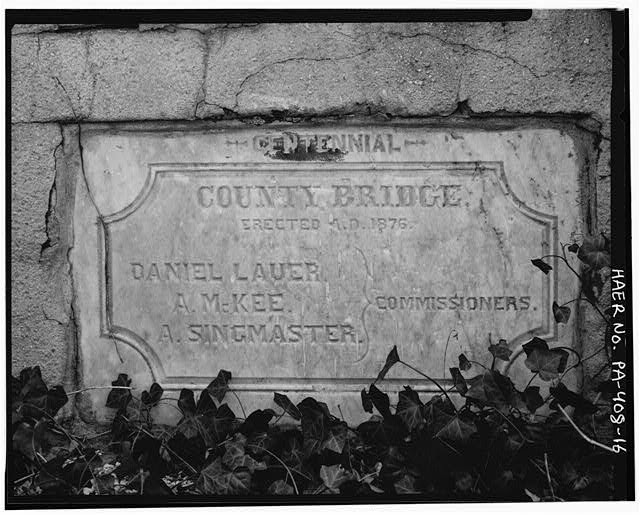 The venerable old bridge stood functional for 116 years, and would go on to live for another 21 years when it would be torn down in 2013. 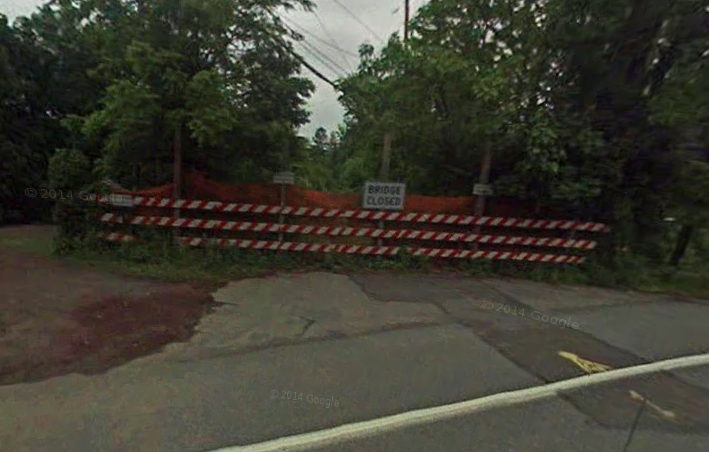 The structural cracks that PennDot cited were obvious if you peeked through the barricade. The roadway portion of the bridge, still the same shimmery asphalt as the old portion of Station Avenue leading up to it, was a good half foot to a foot sunken in. Sadly I never took any pictures of the bridge in this state. My assumption is that it was no longer safe to leave this bridge up, so they demolition commenced in 2013. Here is a Google Maps Aerial View of the bridge location in 2012. Quite a bit of this little village remains intact, including the tradition of agriculture. Desales University, formerly Allentown College, sprang up just down the road from this village. The Victorian homes that remain in this little village are pretty neat. A neat Freihofer's Bread, glass window advertisement still remains in the window of the building. I believe it is now utilized as a residence. As someone who is always looking at the origin of old structures and different things, my attention naturally was attracted to this bridge. I grew up not too far from this location. I always recall being fascinated by this bridge. For some reason I did not go and take photos of it when I still lived there. I did not have a camera yet at that time though, so I only have memories of what I could see exploring the perimeter of it. 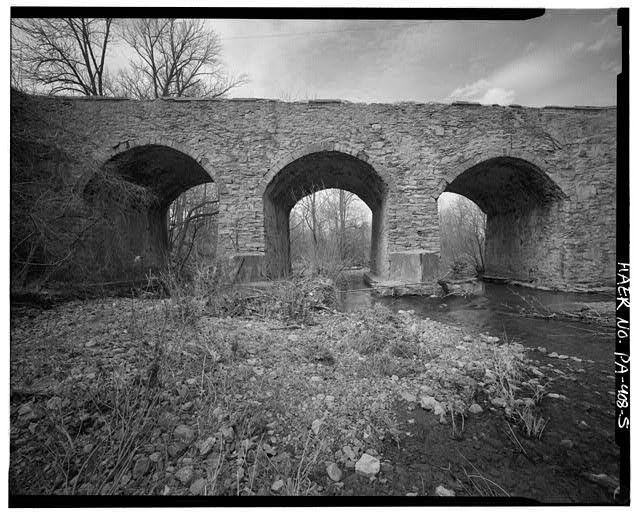 It is a shame to see an old bridge like this get torn down, but it needed to happen for safety reasons. 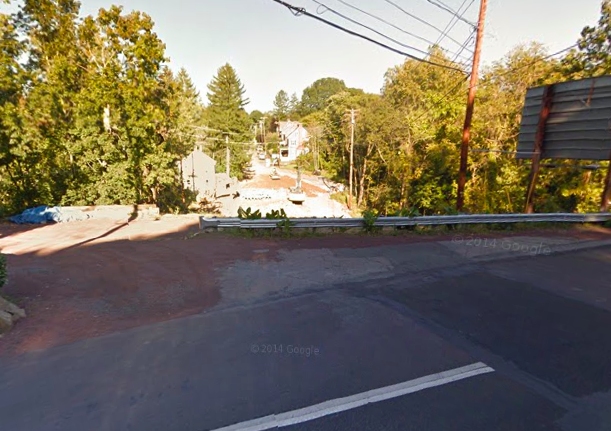 This is how the area of the old bridge looks now on the Station Avenue side. I took these photos in December of 2013. I went home over Christmas time and was surprised to see the old bridge gone. This is one of the more strange abandoned things that I have seen. Maybe it is my personal connection to it that makes me so interested in it, but there was something so unique about this bridge. It is shame that they could not preserve it. I am glad that they made a little park area out of the land, along with placing this memorial. 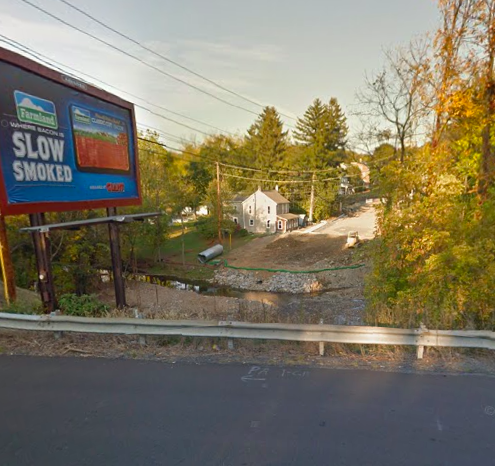 The Saucon Creek is a great trout fishery and it is nice that they opened up some of the land for the public. 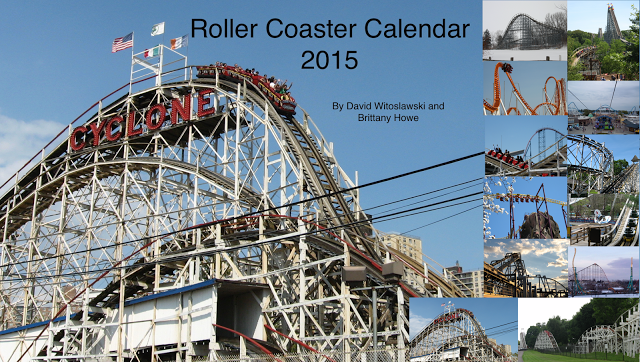 Available now is our 2015 Roller Coaster Calendar. It is on early-bird special and available through this link! 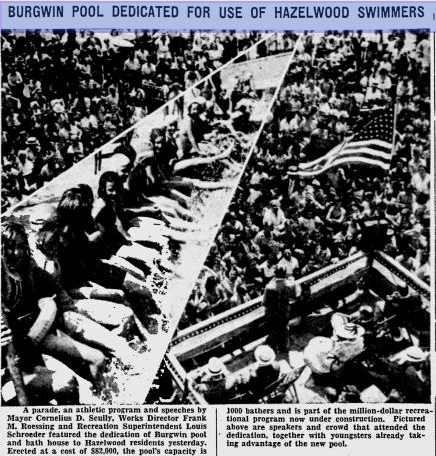 So I was driving through Hazelwood and noticed the old Burgwin Pool and Bathhouse. It was captivating and strange to see a pool in this sort of condition. Flashback to 1939. The pool is opened with lots of fanfare including a parade, speeches, and a dedication. 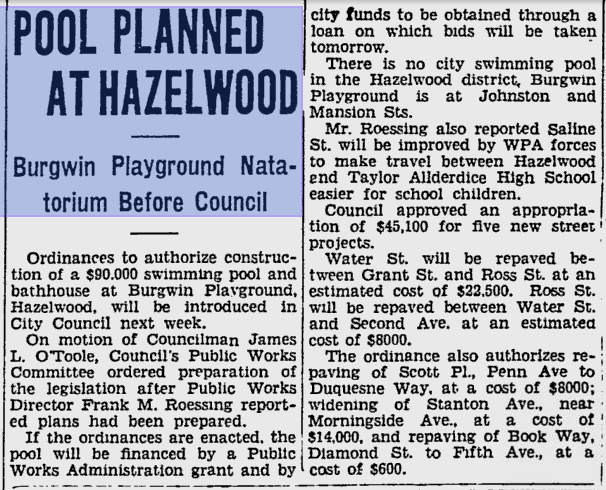 The nearby Burgwin Elementary school (now closed) was built by the WPA (Works Progress Administration) as a part of FDR's New Deal program. The bathhouse was built in a semi art deco style. It appears that quite a few neighborhood improvements were occurring at this point. Back then, this neighborhood was a gritty industrial area, with steel mills located front and center. 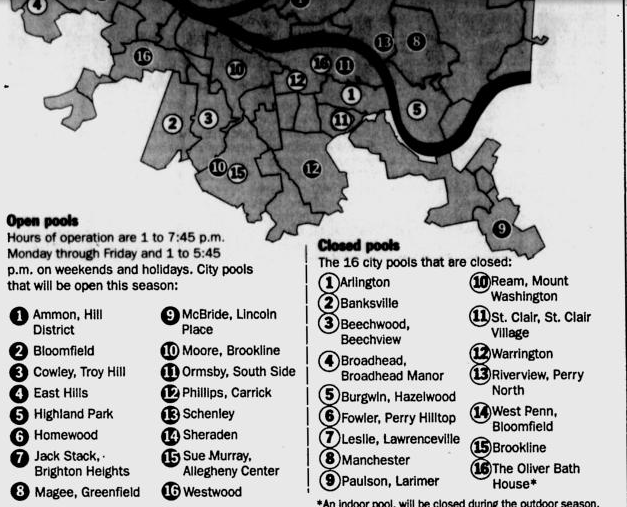 With some archive searching, it appears that the pool was closed in 2004. So this is what ten years of abandonment does to a pool. Plan on going off the deep end? Someone placed some wooden pallets on the end of the pool in what appears to be a MacGyvered diving board. I don't think you want to take the plunge into the weeds though. It is a shame to see a huge neighborhood like this not served with a pool. The results of abandonment though are pretty interesting to look at. Available now is our Roller Coaster 2015 calendar! It is on early-bird special and available through this link!